Jourden H. Banks, b. 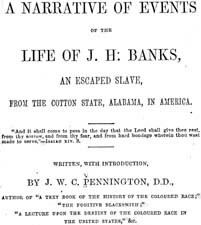 1833 A Narrative of Events of the Life of J. H. Banks, an Escaped Slave, from the Cotton State, Alabama, in America. A Narrative of Events of the Life of J. H. Banks, an Escaped Slave, from the Cotton State, Alabama, in America. Liverpool, Eng. : M. Rourke, Printer, 1861. Banks, J. H., b. 1833. Fugitive slaves -- Alabama -- Biography. Slaves -- Virginia -- Social conditions.